When ten sheep farmers in southern France got on their tractors one day in August, 1999 and headed down the highway to Millau, instead of to their fields, they hurled themselves in the global spotlight by dismantling the construction site of the most conspicuous symbol of USA dominated globalization – McDonald’s. Bove and his colleagues knew what they were doing; this was no sudden act of whimsy or malice. Although they knew that their destruction of famous property would lead to a long road through courts, they had a cogent and important reason to seek publicity and legal battles. They probably did not anticipate that Bove, their spokesperson, would come to be considered the Robin Hood of France. 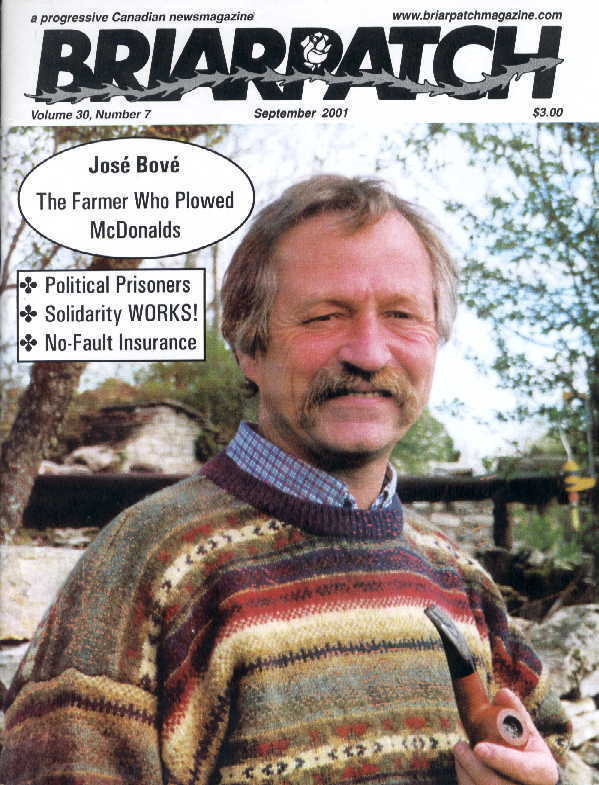 Jose Bove, a fifty year old farm union spokesperson, has many decades of experience as an activist and resister to unjust government policies. Thirty years ago he was a conscientious objector to compulsory French military service and active in the peace movement in Bordeaux. At that time the military wanted to expand a testing range in the high Larzac region of south-central France, a windswept, scoured plateau with a small population of sheep farmers. The government bought out one large land owner, not a farmer, but a speculator who had bought up property near the existing military range. Local farmers, angry at the threatened loss of their living and their rugged, beautiful homeland, called on peace activists, including Bove, to help them organize against the military takeover. Demonstrations of over 100,000 people were frequent and as the protest continued through the seventies, Bove and others occupied abandoned properties. Victory came in 1981 when Mitterand was elected president and cancelled the military expansion. Then, the seventy-five families who were squatting formed an association that negotiated and signed a long term lease for the use of the land for sheep farming. A hard life, but one that hardy, independent peasants have valued for centuries. The soil cover on the limestone is fragile, only a few inches thick, and can support only one sheep per hectare. It is a peaceful land, I found it disturbing to think of tanks and guns desecrating its beauty. These are no ordinary sheep, but special Lacaune milk ewes for Roquefort cheese. This cheese is made of milk produced by only 2000 farmers in the Larzac Roquefort region. Roquefort cheese is so special in region and production that it and Champagne were the first products awarded the prestigious “appellation d’origine controlee” designation in 1925. This summer I found three packets of Roquefort cheese selling at the Hornby Island Coop store for $40/ kilogram. That is pretty pricey cheese anywhere. There lies the connection to cheap fast food at McDonalds. ( No, there isn’t one on Hornby Island.) We met with Bove, at home in a 200 year old stone house, in a hamlet of six farmhouses. Now that he works fulltime as one of three spokespersons ( it has no president) for the Confederation ( e acute on both e’s) Paysanne, the CP, France’s second largest farm union, he is not working with the sheep. His partner, Ghislaine Ricez, is the administrator of the farmers association that holds the land in stewardship for future generations.. After she left for the office we settled down for coffee as he explained the events that lead to the famous McDonald’s incident. When the EU banned the import of hormone treated beef from the USA. The WTO allowed the USA to impose 100% import tariffs on a long list of seventy European imports. On the list was Roquefort cheese. Roquefort producers soon learned there was no political recourse for farmers, whose sales were threatened by these tariffs, although the export of cheese and import of beef are totally unconnected. They investigated legal avenues and found there was no court in the world where farmers could appeal to the WTO about this unfair tax. In France, the most glaring symbol of USA global imperialism has to be McDonald’s. Their fast junk food challenges the whole culture of French cuisine and the golden arches soar in nearly every town and city. McDonald’s is also a symbol of how the WTO attempts to control world agriculture and food consumption. After guilty sentences for their property damage to the great icon, in three courts, the farmers continue to appeal to higher courts. Every trial has been accompanied by demonstrations of up to 100,000 supporters from around the world. Only when they have exhausted all levels of national courts can the farmers appear before the European Union court of human rights. There they can put their case that the USA tax is unfair and a violation of the rights of Roquefort producers who had nothing to do with the ban on hormone treated beef. At one point our talk was interrupted by a call from the French Chef’s organization asking for CP support of their opposition to restaurant taxes of 19.6% because any place that sells take-out food is taxed only 5.5%. Another obvious benefit for fast food chains. Bove says that an added hardship for local farmers is that there are no EU export subsidies for sheep cheese, only for bovine products, meat and cereals, which explains why most European cheese is cheaper in Canada than it is in Europe. One thing is clear from talking to Bove; he is not a one-man-show in spite of his media stardom. The CP was formed in 1987 as an amalgamation of several groups to fight against the industrialization of farming. The group saw the threat of productivity at all costs. That includes the inequality of land subsidies that favour large mechanized farmers, the disregard for the health of animals and the physical environment, the lack of farm employment and the difficulties for young people to become farmers. It is a major concern that 30,000 small farms are lost every year in France and only 10,000 new farms are started. The union also has a strong position on the effects of industrial farming and globalization on farmers in the majority world. The CP is a member of Via Campesina, as is the National Farm Union in Canada. This international organization works for fair trade and decent prices, a good environment that produces good food, and secure and healthy working conditions for farmers worldwide. Bove recently went to Columbia to support U’AA people who were being driven off their subsistence land for oil development by Occidental Oil, Al Gore’s company. Bove outlined the aims of these farmer organizations. They want trade of food products, but only after food security has been established for local and national populations; the first priority of any country is to feed its own citizens. This is contrary to the WTO ruling that any country that exports an agricultural product, even if it also fulfills all national needs, must allow the import of 5% of the same product. The result of this policy is dumping from abroad, often from countries with high subsidies that lower local prices with disastrous results for local agriculture. Farmers loose their livelihood and their land. Bove says that food subsidies to protect national food security and production are acts of sovereignty, not dictates of the market. He passionately makes the case for international agreements, under any name, that establish real rules for real rights for people. By that he means, not rules that benefit only corporations, but rules for human, economic and social rights for people that also protect the environment and biodiversity. At the end of the interview I asked about how he now sees the connection between militarism and food security. Bove replied that global militarization imposes the standardization of life and culture by the strong on the weak. He said that the symbol of the decades long struggle against the military, that has taken him from France to the South Pacific to oppose military testing, to Columbia to support the resistance of the U’UA people, and from Seattle to Quebec, is an overturned soldier’s helmet filled with growing wheat and the slogan: “Arms Kill: Wheat Gives Life.” Then Bove directed us across the rugged, beautiful landscape to see the church-like stone sheep barn that was built in 1983 to celebrate the liberation of military land for farming.